Congratulations go out to Haru Nomura for winning the Swinging Skirts LPGA Classic. 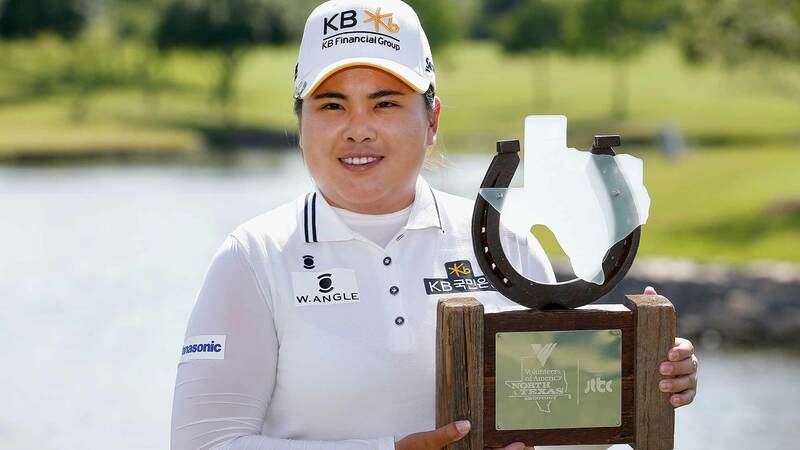 She now joins Lydia Ko and Ha Na Jang as two time winners on the LPGA tour this year. Inbee Park will not be teeing it up this week because of a left thumb injury. This will be tournament #11 of 33 on this year's LPGA schedule. My strength of field rating is 65%, down from 71.5% last year. Thirty-seven of the top 50 players from the new LPGA priority list, and 16 of the top 25 players from the Rolex Rankings will be in attendance. Not teeing it up this week include: Lydia Ko, Inbee Park, Ha Na Jang, Brittany Lincicome, Chella Choi, Haru Nomura, and Jessica Korda. My alternates are: Charley Hull, Carlotta Ciganda, and Amy Yang. In spite of some horrific picking last week, I currently reside in 2nd place among the 19 participants. At the completion of this tournament, the LPGA will have completed exactly (11 of 33) one third of its schedule. Both Paula Creamer and I.K. Kim missed the cut this past week, stopping their cut streaks at 13. Brooke Henderson's 6th place finish was her 8th consecutive top ten finish this year. Nobody else on the LPGA tour has more than 6 top tens this year. The last four tournaments have been won by players not playing for either the United States or South Korea. Julie Inkster, soon to turn 56 years old, continues to play competitive golf. She has not missed a cut this year. She has made the cut in her last 8 starts, and finished 19th this past week in the brutal San Francisco winds. Brooke Henderson jumps past both In Gee Chun and Sei Young Kim, and moves up to #5 in the world rankings. Haru Nomura catapults from #36 to #23, and Lee-Anne Pace Jumps up from #53 to #31. Lydia Ko continues to lead with 2,119 points. She is followed by Ha Na Jang (1,449), Haru Nomura (1,442), Sei Young Kim (1,164), and Lexi Thompson (1,027). Gerina Piller has 3 consecutive top 6 finishes, and 5 consecutive top 13 finishes. Yani Tseng has failed to finish better than 60th in any of her 8 starts this year. She has missed 4 cuts. Beatriz Recari does not have a top 20 finish in any of her 9 starts this year. UPDATE #1 - Erica Popson and Hannah Collier are the Monday local qualifiers. In the 9 wins this year besides Lexi's, Korean players have 4, Lydia Ko (born in Korea) has 2, Harua Namura with 2 wins is half Korean (mother). Minjee Lee was born in Australia but her parents are Korean. So a Korean connection in 9 of the 10 wins this season. There are several other Korean players on the tour with a great shot of winning themselves. Dewi Schreefel did not make the weekend in San Fran but young Su Oh did. In spite of not making birdie on Sunday she finished T19 and should be recognized for an outstanding finish under rough conditions. Best wishes to Erica and Hannah and let's hope they can raise the percentage of the Monday qualifiers by playing 4 rounds each. Is Lydia Ko the New Tiger Woods?